Dr Catherine André and her team are working on a lot of different research on animals, as she said yesterday: " the blood samples that we all send in are stored and used when there is a study started due to appropriate funding." Sometimes they can work fast, sometimes it is much slower due to lack of funds. Also, it is "easier" to do the research on dogs.They set up the genetic tests.If something can be found and identified in a dog, the application goes to humans. 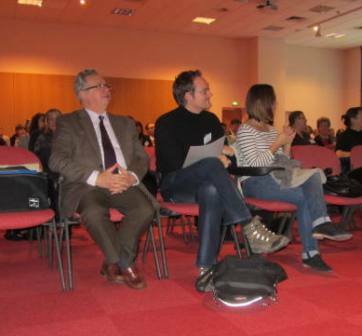 The CNRS in Rennes works with other researchers around the world, Finland being one of their "partners". Below, a link to research on the Lagotto and results. The more you use a male/super stud/champion, the more you run the risk of spreading a bad gene that has not expressed itself yet, to a wide population of dogs.That doesn't necessarily come out in the F1 generation.We're not just talking Barbet, but DOGS. A stud should not produce more than 5% of the litters in a period of 5 years. Clubs are supposed to help breeders establish the criteria. 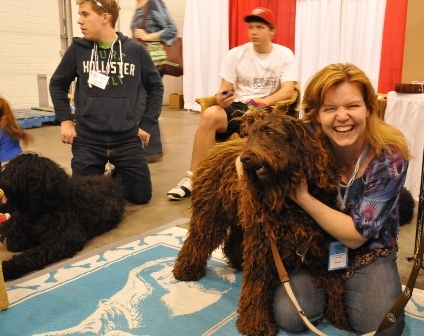 Photo of Frankly and Paula at All About Dogs...a while back! I had never seen this photo until very recently and since I am working on Barbet nomenclatura for colors...is Frankly a red Barbet and Paula a redhead?...I don't think so! 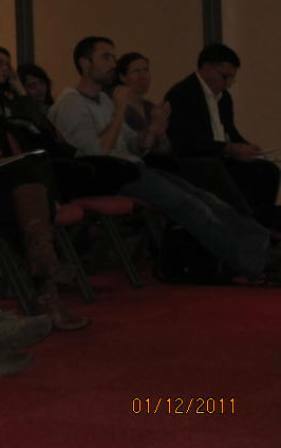 Amazing...me, far left. Do you recognize me? I was really looking forward to this seminar with ALL the big wigs from the SCC and different commissions of the SCC. Interesting information, lots of time to talk and ask questions; timetable to a T. All very well organized with breaks and enough food for all! Bravo. Got my colleague to do my classes. Up at 5 ( as is often the case)back at 7pm because I left before then end of the event, dogs having been alone for a real long time! Let me tell you; it was worth every second and cent. I will try to resume it in a few lines for all of us, interested in the survival of the breed, our breed. Not tonite though. I am going to take care of my dogs! Sneak preview: lots of talk about overusing same studs( worse in a small breed), and eliminating carriers of anything and potentially sick dogs reduces by 75% the stock we have in our breed. That means that all dogs will have (again) same names in pedigrees and we will be working with 25% of our breed's potential. 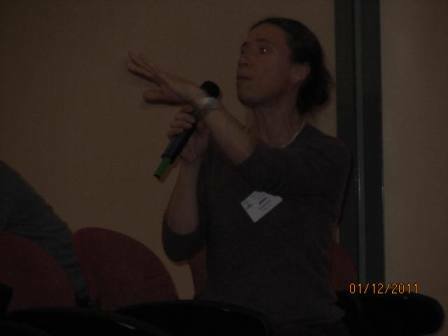 Dr Catherine André, who is in charge of research at CNRS in Rennes ( epilepsy in breeds, among which the "Barbet"; Dr Gilles Chaudieu, specialist in eye diseases whom some of us saw in 2005. 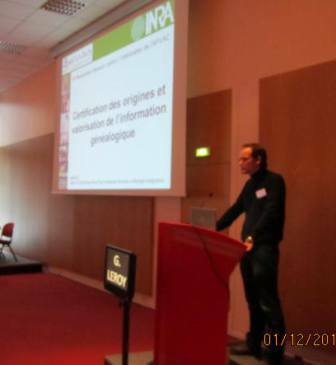 Grégoire Leroy in front of a room full of breeders (150 people)talking about pedigrees and databases. (I recorded the answer on my MP3)Working with falsified information is lethal. 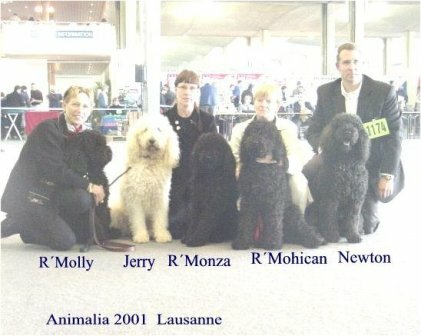 Many posting on sites and blogs are trying to convince one and all that their dogs are the bestest and that they are so wonderful to take all the pups' growing up to sounds and textures and what have you and how difficult it is to breed and how they are such great breeders......I say "Baloney". I have always loved dogs since I was 3 years old and out of sheer logic you try to do what is best for them.I love my dogs, I love coming home to them, I hate leaving them for a long time because I want to see them. I love my pups and do my best to keep up with them even though sometimes it is made difficult by some. So when you see this video below, you just cry. That's all. Caged Barbets, of course there are some who can't run and swim and be real barbets...then you want to scream, too. A 2 year old dog who has never been out of a cage? They don't just have to be in laboratories to go through that! 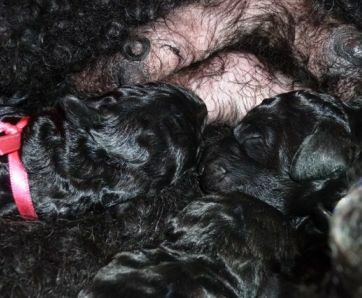 Here are slices of the 6 pups born last week in Paris. Mom Djazzy is doing well and pups are putting weight on like champions...Father Booly real Wooly is thinks it's a shame there are no browns, but that's life! If all goes well, there will be 12 offsprings of Booly Wooly working in Paris in 2012!